HPY Multi-cylinder Hydraulic Cone Crusher is a kind of new cone crusher which has been optimized designed and manufactured by our company based on introducing domestic and overseas advanced technology of hydraulic cone crusher. It has the features of high reliability, huge production capacity, high automation, easy operation and maintenance, good product shape and low cost for wearing parts. After many years' development, multi-cylinder hydraulic cone crusher has become the first choice in the market instead of the traditional cone crusher. 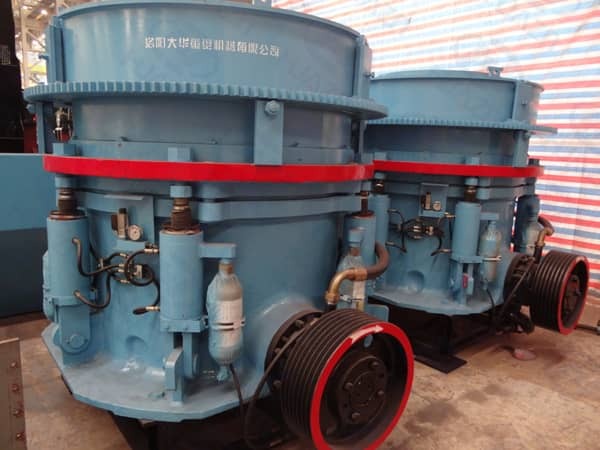 It is found by Luoyang Dahua after summarizing years' site operation experiences that the service life of crusher can be prolonged by means of some simple operation methods. 1. Install buffer material bin and variable frequency feeder. Because the multi-cylinder adopts laminating crushing principle, it needs evenly feed with large quantity. Therefore, the buffer material bin should be equipped before the crusher machine to ensure continuously feeding. The feed quantity must be adjustable, it is suggested that the variable frequency feeder is added to guarantee stable feeding. 4. Adjust discharge opening in full feeding condition. Because the minimum discharge opening cannot determine the minimum finished products granularity, when you commissioning the machine, you must make sure fully feeding, and then adjust the discharge opening according to its load to let it reach the proper production load and finished product granularity.